The memories of a miserable start to 2013 have begun to fade. Today, we embrace the prospects of a third consecutive blockbuster opening weekend. Grab a flashlight, nerds! Now is the moment when you Trekkies/Trekkers can head Into Darkness. In 2009, upstart Hollywood director J.J. Abrams leveraged his ascending reputation as the producer of Cloverfield and Lost as well as the director of high quality action flick Mission: Impossible III into his best gig to date. He was named the new architect of the Star Trek universe. 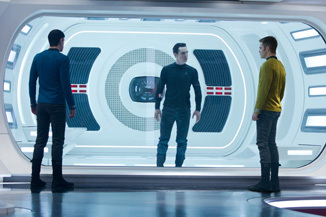 Abrams refused to cater to convention by creating another Star Trek sequel, instead choosing to re-tell the story of the most iconic characters from the franchise, James Tiberius Kirk and Mister Spock. While the idea is difficult to imagine now, the Star Trek franchise was in shambles when Abrams was recruited. Enterprise, a television series expected to anchor the now defunct UPN network, was canceled during its fourth season. When the final episode aired in May of 2005, the future of Star Trek was bleak. No one could imagine at the time that Abrams would do for Star Trek what Christopher Nolan did for Batman.